With New Year's behind us, it's time for my annual plea for you to put giving up distracted driving at the top of your resolution list. Although we tend to think of distracted driving as involving texting or talking on the phone, any number of other behaviors can distract a driver from their main task (i.e. driving): eating, adjusting a radio, reading maps, even talking to other passengers. I've been working hard on eliminating the cell phone use from my drive over the past three years, but I admit that there are still other behaviors on this list I should be paying more attention to. One of the key issues is that while most people seem to agree that distracted driving is a problem, their beliefs don't translate into behavior changes. 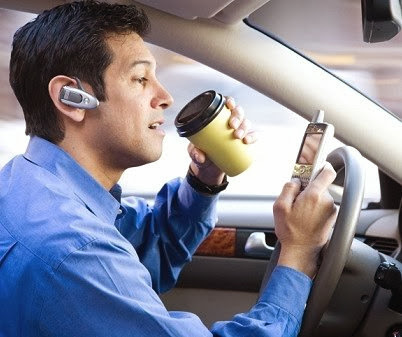 According to one report by the AAA Foundation, "A percentage nearly identical (67.3%) to the proportion of drivers who disapprove of hand-held cell phone use admits to talking on the phone (of any kind) while driving in the past 30 days ore than a third of licensed drivers (34.7%) admit to reading messages in the past 30 days (7.7% fairly often or regularly), and a quarter (25.8%) typed or sent them (5.5% fairly often or regularly)." While distracted driving deaths have fallen in recent years for motorists, pedestrian and bicyclist deaths from distracted driving have increased. In 2011, 495 non-occupants were killed in distraction-affected crashes. 55% of the people killed during teen (15 to 19) distraction-affected crashes were other teens 15 to 19 years old.